Another smaller growing maple that thrives in a semi shaded position is Acer japonicum ‘Vitifolium’ with attractive new bronze coloured growth. New foliage is green however the autumn colour is a brilliant red. 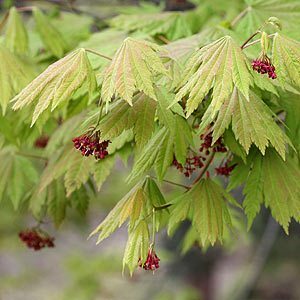 In inner city areas Acer japonicum ‘Vitifolium’ is useful as a small street tree especially when planted in shaded areas, it only reaches around 5m and could be used as a small tree in a shady forecourt. Also useful as a specimen tree at the rear of the border in smaller gardens. Stake when young to ensure a good upright habit, try to choose a specimen with a good leader as this maple can be a little shrubby is a poor form is chosen. Care is limited to removal of any dead or damaged branches. Relatively disease free but does require some moisture during dry periods. Plant in areas that are not exposed to full sun and hot drying winds for best performance.